As part of the Spitalfield's Summer Festival, last night (15 June 2016) Club Inégales found a new home at Wilton’s Music Hall for a late evening performance of Korean music by Gamin and Hyelim Kim, plus an eclectic improvisation between Gamin and Hyelim Kim and the house band, Notes Inégales. 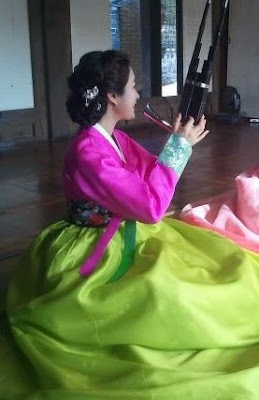 Gamin was classically trained in jeongak (Korean court music) and sinawi (shaman ritual music), however, she is also interested in bringing traditional instruments into a contemporary setting, including composing her own music, and creating a modern sound by integrating with orchestral instruments and electronic techniques. She has released several albums of her music and has collaborated in the production of art installations to critical acclaim. Hyelim Kim is an ethnomusicologist at SOAS and is interested in traditional Korean culture and how this has been transformed throughout history. As well as a performer she is a composer in her own right and has also released an album showcasing traditional and contemporary music. Gamin began the concert with a recital on the piri, a double reed bamboo oboe with open finger holes. The sound was extraordinarily loud for such a small instrument and the music somewhere between eastern and oriental. Much of the piece sounded as though rooted in one or more pentatonic scales, while the tone of a double reed oboe, style of vibrato and slides/ornamentation reminded me of eastern European/ Persian styles. Histories of Korean court music suggest that Korean music and instruments, while having Chinese or religious influences were also subject to local invention - hence the unique sound. The saengwhang is an ancient Korean instrument made from 17 bamboo pipes with an entirely individual sound. Gamin explained that they are very rare, but there has been a resurgence in interest and now new instruments are becoming available. It is the only Korean wind instrument capable of playing chords (Korean music not being based on harmony) and traditionally it was used in chamber ensembles and would be used for "calm and gentle" music. Tonight however she played for us her own composition of atmospheric meanderings based on a traditional melody. The sound from this instrument was incredible - see the video below. A high pitched drone overlaid the melody, and she seemed to be playing both on in and out breaths leading to an accordion-like continuous sound. As the work progressed some deep notes, which appeared to be sung at the same time as the continuous playing, could be heard and some flute-like fluttering effects. Gamin was joined by Hyelim Kim for some improvisations on traditional folk music. 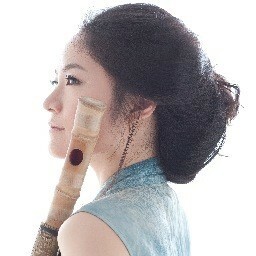 The taegŭm, played by Hyelim Kim, is a transverse bamboo flute with six finger holes and an internal membrane which buzzes when overblown. She explained that the sound of the taegŭm in folk music is believed to bring peace to the countryside. The improvisation was started by Gamin on the taepyeongso, an extremely loud double reed oboe shaped like a horn. Gamin explained that it is usually used marching bands, hence the volume, but that she wanted to show it to us. This was followed by an atmospheric duet between taegŭm and piri. Fresh from playing Purcell's King Arthur, Notes Inégales plus Gamin and Hyelim Kim ended the hour-long session with a drifting "improvisation with organisation". The organisation was orchestrated by director Peter Wiegold at a keyboard elevated on metal rubbish bins. He controlled who played and if he liked an idea someone played, asked the others to copy or improvise on it. In that way the piece developed through several themes and phases where the music condensed or relaxed, working their way to a climatic ending. The late start meant that the audience was small. However as a short, clever introduction to unfamiliar and interesting sounds in the relaxed setting of the splendid Wilton's hall the performers did not put a foot wrong and there was something for everyone to enjoy.